I received a basket of enormous, homegrown onions from a family friend. Layers of thick dirt muted the rich golden tones of the onions. Each one had just been picked and a mass of dried out, dusty stalks, like wild hair, was sprouting from the bulbs. I wasn’t sure what to do with so many onions until I read this week’s parsha, Matot-Massei. 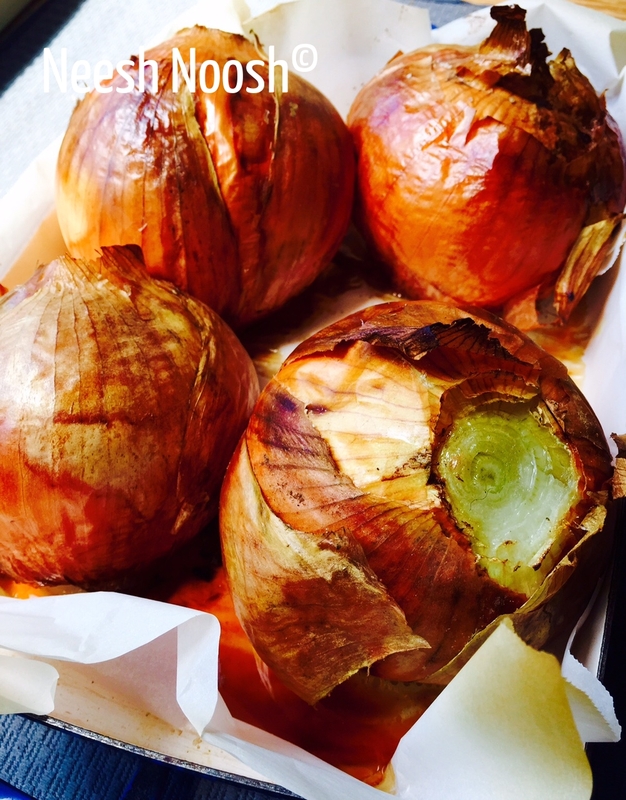 I prepared a simple roasted onions side dish. These concentric circles of onion are delicate, rich in flavor and easy to prepare. This week I offer many different thoughts about the onions and how the dish relates to themes in the parsha. From Small to Large: As slaves in Egypt, the Israelites were “small.” They were constricted and limited. A friend always reminds me about not being “small” in the world but stepping into my identity and fully expressing myself. The enslaved Israelites are the small center of the onion and as they travel on their journey in the wilderness, they move beyond their small selves. Their personal and communal challenges enables them to grow, expand and step into their power as Israelites. Is it a linear process? Absolutely not. And, as the descendents of the Israelites, our own journey–both individually and communally–continue today. 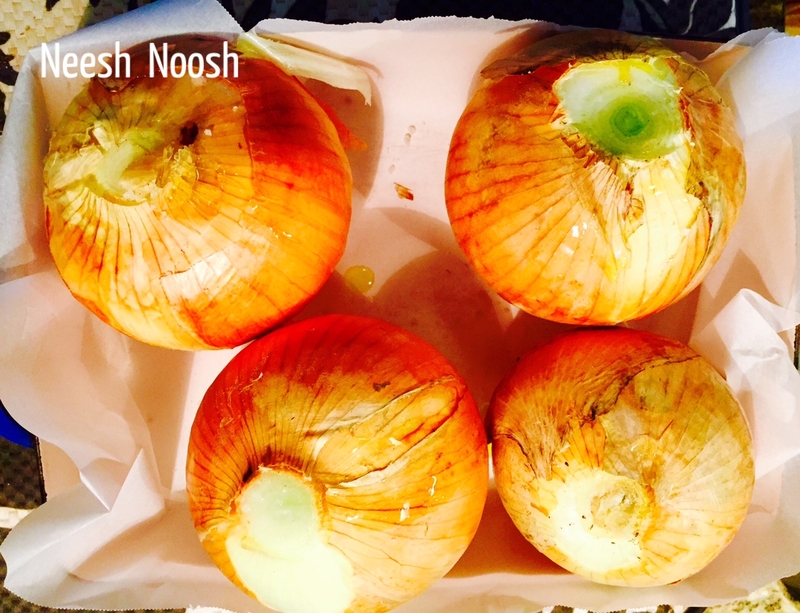 Transformation from Bitter to Sweet: Raw onions are an intense, visceral flavor. They can overwhelm a dish and make one cry when cutting them. Roasted onions, though, are transformed into a sweet, delicate dish. This is like the Israelites journey from the bitterness of Egypt to the sweetness of the Promised Land. It is also a personal transformation towards God. The Israelites were often bitter towards God in their journey from Egypt to the Promise Land. Each Israelite in their journey in the wilderness, was challenged to turn their hearts to towards God, during times of doubt and fear. Tabernacle and God at the Center: The concentric circles of the onions also represent the placement of the tabernacle at the center of each camp the Israelites made in the wilderness. We are each challenged to connect with our with what guides us-at the center of our lives and hearts. Godliness in our Daily Lives: Even the must mundane acts in our lives-buying food, cooking, and commuting, are moments to connect with God. 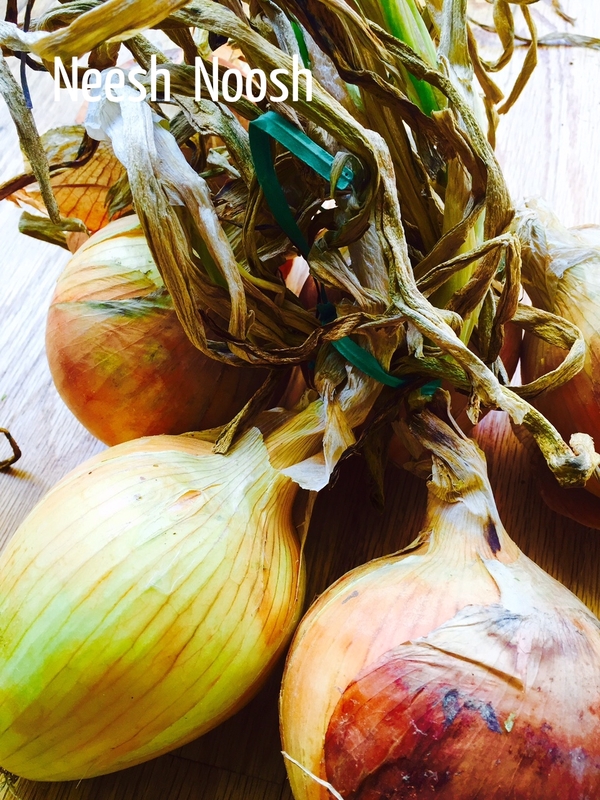 Rabbi Shai Held writes, “even seemingly inconsequential stops on our journey can be powerful opportunities for serving God.” Indeed, simple onions can make a huge statement about our relationship with God. From how they are grown, to who grew them, are moments to live in relationship with God by choosing foods that are produced in harmony with our environment. Referring to a teaching by Rabbi Avraham Isaac Kook, Rabbi Held writes, “we can know God in all our ways (be-khol), but that we can know God in (be-khol) all our ways.” When we grow, buy and eat foods raised without pesticides and other toxins, we are making choices to be partners in protecting God’s Creation. City Walls: The Torah portion also discusses who is welcome within cities walls. “These six cities shall serve the Israelites and the resident aliens among them for refuge, so that anyone who kills a person unintentionally may flee there” (35:13). The onion’s outer ring is like the city walls, protecting those within it. How are our cities refuges today or not? How do we welcome and support those with the least resources and opportunities to the center of our cities? Are these people embraced and uplifted by fellow residents or thrown outside our city walls? I recommend checking out my friend Rabbi Dr. Aryeh Cohen’s blog, Justice in the City, for further exploration of this topic. 1. Pre-heat oven to 400 degrees. Line a baking pan with parchment paper. 2. Trim the ends of the onions but keep skins on. Wipe skins to remove dirt. Place onions on a tray. Drizzle with a bit of olive oil and a pinch of sea salt. 3. Roast for approximately one hour, until soft inside. Remove from oven. Peel skin off before serving. Save the sweet liquid run-off from the onions in the pan. Scoop it up and drizzle over the tops of each one. Option to add salt and pepper to taste. 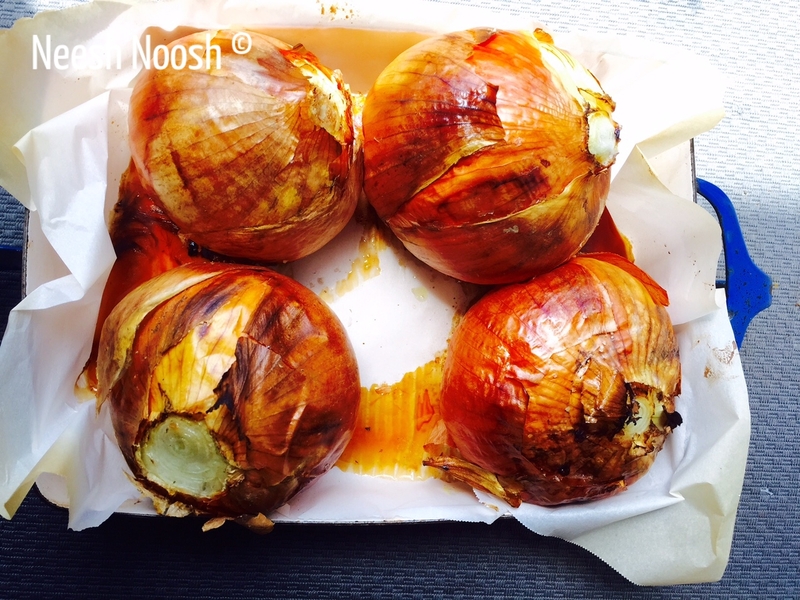 This entry was posted in Matot-Massei, Parsha, Side dish, vegetable and tagged cooking, food, local, organic, recipe, roasted onions, Shabbat, social justice, Torah, vegan by Sarah Newman. Bookmark the permalink. Wonderful idea, easy to preapre and looks very tasty. Going to prepare soon. Great-I hope you enjoy it! The recipe sounds delicious and the onions look amazing! Thanks.